Mr. Globe Trotter was in the capital of Canada for a quick visit. 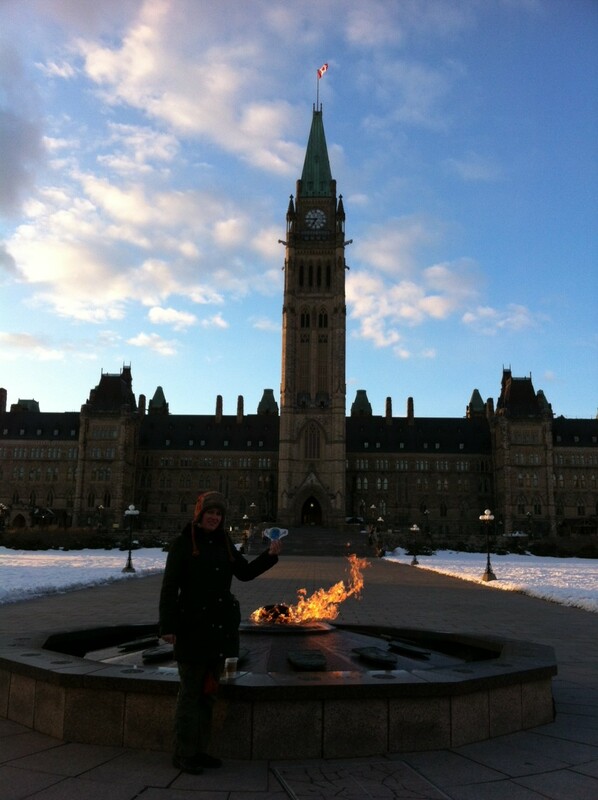 My friend Averil and I took him to the Parliament Buildings, where our government sits. The tower in the middle of the attached photo is called the Peace Tower. The people near me show me how to be “caring” by giving a hug when I feel sad, and by volunteering for various causes. They show how to be peaceful by demonstrating respect for other people’s feelings and ideas, even when they don’t agree with them. In Ottawa, the two main languages are English and French. The area of the city that I live in is called Vanier. It is a distinct French community in the middle of Ottawa, and it used to be a completely separate city, surrounded by the City of Ottawa. A city within a city, with it’s own mayor and library. We are a very multicultural city, with people from all over the world living here. We also have one of the world’s longest skating rinks, the Rideau Canal. People in Ottawa do a lot of skating in the winter, because it gets really, really cold here. In the summer, we do a lot of hiking and camping in Gatineau Park, which is in Quebec (Canada’s French-speaking province). It is only a 15-minute drive away and is a huge park with lakes, hiking trails, and wild animals like bears, rabbits and foxes. Although we have rabbits and foxes in the main city, too! We celebrate the major Christian holidays in Canada, Easter and Christmas, and we also take time off in February to celebrate Family Day. Our other holidays are Victoria Day Weekend in May (for Queen Victoria of England), Canada Day (July 1st), Labour Day (the first Monday in September), Thanksgiving (ours is in October), and Remembrance Day (November 11 – it’s like your Memorial Day). We also celebrate New Year’s on December 31st. At the child care centre where I work, we also recognize holidays like Lunar New Year, Persian New Year, Ramadan, and Divali, because we have families that come from so many different countries and cultures. This region of Canada is known for Poutine: it’s french fries covered with cheese curds and gravy! It’s not very healthy, but it is pretty tasty. More of a “sometimes” food. As a vegetarian, my diet consists mostly of fruits, vegetables, beans and tofu. I’m sending Mr. Globe Trotter across the “border” into Quebec with my friend Averil! Bonne voyage, M. Globe Trotter!